As visitors traveled farther into the RCA Pavilion they could enter the “Hall of Television” that contained thirteen of RCA’s finest TRK-12 receivers. These receivers displayed images almost constantly in order to allow each visitor to sample the new medium. Also in this room was an experimental projection television receiver, which used a very bright five-inch cathode ray tube and a large lens to project television pictures onto a special light reflective screen. The pictures generated by this unit are believed to have been at least three feet high and four feet wide. A large Nipper the Dog statue (that familiar dog who listens to “His Master’s Voice” on the RCA logo) overlooked the room from a pedestal. 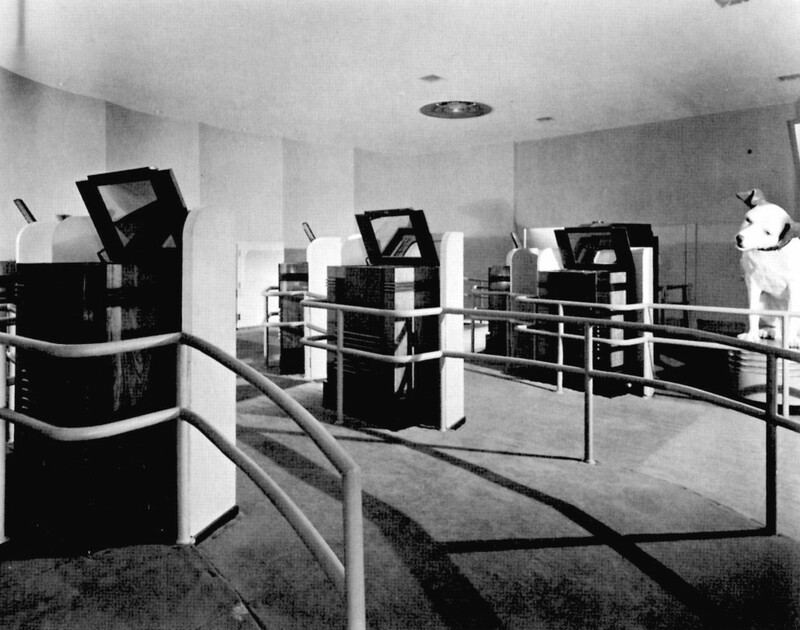 In the Hall of Television, visitors crowded together to watch National Broadcasting corporation (NBC) broadcasts or internal closed circuit demonstrations.